Frustrated with your fancy new MacBook’s single USB-C port? OWC wants to be your laptop’s knight in shiny, connected armor with a brand new USB-C dock that turns its lone port into 11 additional connections so you can have all of your hardware and accessories plugged in at the same time. You’ll not only get an extra USB-C port to make up for the one the dock is occupying, you’ll also get four old-school powered USB 3 ports, including two putting out enough juice to charge a larger mobile device like a tablet. The dock also includes a built-in SD card reader, gigabit ethernet, analog audio connections, and HDMI supporting resolutions up to 4K. You’ll need to use its included power adapter to take advantage of all its features, which means it’s not particularly portable. But given its size, you’ll probably just want to leave it on your desk for those times when you need to use your MacBook for serious work. 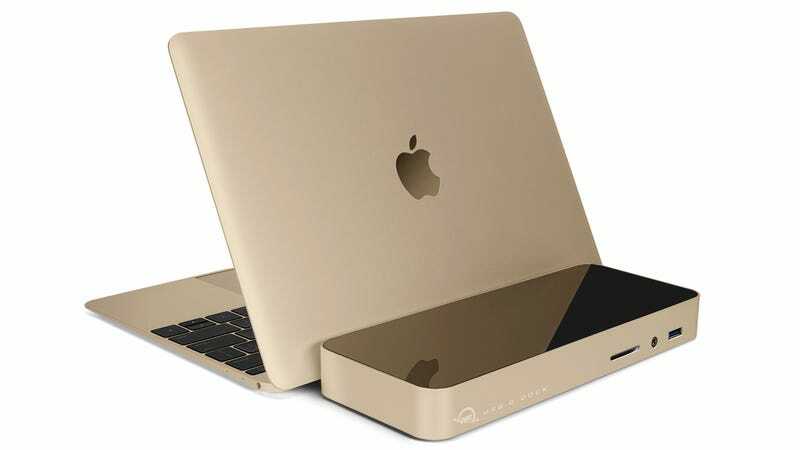 At $129, available come October in three matching colors, it’s an expensive way to fix the new MacBook’s limitations. But with a laptop that small and thin, you knew there’d be some trade-offs.